Sammy Cusick, who was a candidate for the Republican Network for Unity in the recent local elections, was arrested and his family harassed in his absence, including his young daughter. He was hospitalised on Friday with a heart attack, justhours after his release. Speaking before he fell ill, he said: “My wife had to twice stop them questioning her, the young child was hysterical throughout. He said that while he was being interrogated in Antrim base, he was constantly threatened that if he didn’t admit to illegal activities they would arrest his 11 year old daughter and bring her in for questioning. While he was being held, the PSNI came back to his home and again asked his wife, Christine, if she had changed her mind and would allow them to question the little girl. This was refused. “Young Sinead who was standing beside Christine shaking with fear was told by the PSNI female officer that the longer she didn’t help them, the longer she was responsible for keeping me in the barracks,” he said. “At that stage the door was slammed in their faces. Mr Cusick was released 36 hours later. “My experience and more importantly the experience my wife and young daughters went through particularly young Sinead is one of the worst experiences of political policing I have ever experienced,” he said. Mr Cusick’s subsequent heart attack was directly related to the stress of those events, according to RNU spokesman Carl Reilly. “This is a matter that should becondemned by all statutory agencies, those who deal with child welfare and elected representatives,” Mr Reilly said. “However, over the last few days there have been deafening silences from those who should be condemning this behaviour. Meanwhile, SDLP Assembly member Pat Ramsey said he was seeking an urgent meeting with PSNI chiefs in Derry to raise concerns after a series of disturbing operations in the city. The Foyle SDLP representative was speaking after he watched a video on social media which showed a young boy, who was celebrating his birthday, become visibly upset at the actions of a PSNI ‘stop and search’ patrol. Mr Ramsey described the video as “distressing”. The SDLP man also referred to another controversial house search in the Creggan area in which a child celebrating their First Communion was traumatised by the PSNI’s heavy-handed actions. “I will be requesting an urgent meeting with senior officers...in order to impress upon them the views of constituents and my own views about the effect of operations on children and young people,” he said. And there are fears that a leading Derry republican has been effectively interned after he was arrested and charged with the controversial offence of ‘directing terrorism’. Thomas Ashe Mellon, from the Creggan, is a member of one of the city’s best known republican families. He was seized in an early morning raid in north Belfast on Friday last (June 6th). 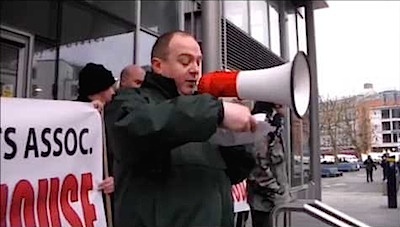 A serial victim of police harassment, Mr Mellon has been subject to false arrest on a number of occasions and was previous charged in connection in 1999 with the charge subsequently being dropped. The charge of ‘directing terrorism’ was previously used to imprison Dundalk republican Michael McKevitt on the testimony of a highly paid informant, a verdict that remains the subject of appeal. On Thursday, prosecutors claimed Mr Mellon could be linked to a a note found in the possession of an unnamed visitor at Maghaberry prison. The note consists of a disconnected series of comments and phrases which allegedly make reference to a breakaway IRA armed group. Mr Mellon was refused bail.